Would anyone have a photo of the dash instruments in a SS2. Unfortunately SS2 dash of first series, before 1933 models, are totally different from late series! I’m looking for some gauges for my very rare SS2 and many of them are similar at Standard Little Nine. What brand are the gauges? Jaeger or Smiths? Black or white faces in the gauge? you haven’t actually specified which year or model you have. And remember when looking at pictures of restored cars, they may often be what someone else has had a guess at. It certaainly would have had the big stater button which just bridged themainbattery cables and the ign switch was justa " spade’ key with " Lucas" and " ing only" stamped on it and the operative bit lookedjust like a screwdriver. If you get a switch I have hada whole batch of the keys made. Not sure what models are represented here. Thanks Graham but none of them! I now have Jaeger but they are not correct for 1933 SS2. 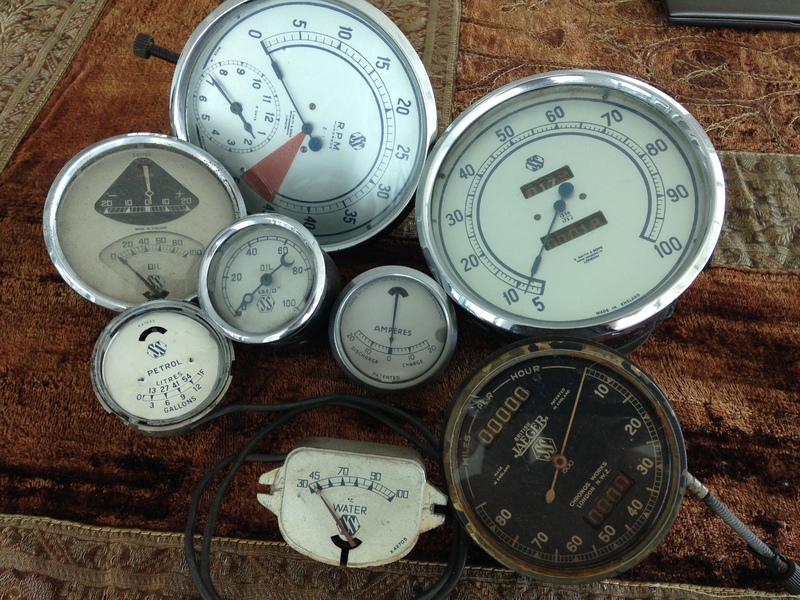 I’m looking for black Standard AC dials (oil and petrol gauges). They have scale on top and arrow on the bottom side. The SS1 fuel gauge is hard in ,as yousay the needle pivots fromthe bottom, not top as as usual.When I needed one the instrument maker inverted the donor Smiths gauge and put the new face on in the appropriate orientation. Then the wiring from the sender will need to e reversed. The car isn’t running yeat so I can’t comment on how ell it works. But franks, I’d never try running on empty with one of these old cars. BUt I suspect Lyons just pinched them from Standards of the period. This may (or may not) be of interest. From a clearance, a Jaeger dual gauge in working order, with copper pipe to cylinder head, type X 42538/10. That gauge looks like what Healey’s had back in the day. Capillary units can be altered for the additional pressure and you already are changing the faces. But to my knowledge SS1/ SS2 never had a split 2" oil / temp gauge.